Parish workhouses existed at Cowbridge, Llantwit Major, Lower Coyty , Newton Nottage, St Athan, and St Brides (Thomas and Wilkins, 1995). County of Glamorgan Bettws, Colwinstone, Cowbridge, Cwmdu, Eglwys Brewis, Ewenny, Flemingstone, Gilestone, Higher Coychurch, Higher Coyty [Coity], Higher Newcastle, Higher Tythegston, Kenfig, Laleston, Lisworney, Llanblethian, Llandough, Llandow, Llandyfodwg, Llangan, Llangeinor, Llanharan, Llanharry, Llanilid, Llanmaes, Llanmihangel, Llansannor, Llantwit, Major, Lower Coychurch, Lower Coyty, Lower Llangynwyd, Lower Newcastle, Lower Tythegston, Marcross, Merthyrmawr, Middle Llangynwyd, Monknash, Newton Nottage, Penlline, Peterston-super-Montem, Pencoed, Pyle, St Athan's, St Brides, Minor, St Brides (including St Brides, Lampha and Southerndown), St Donats, St Hilary, St Mary Church, St Mary Hill, Wick, Ynysawdre, Ystradowen. The population falling within the Union at the 1831 census had been 17,012 with parishes ranging in size from Eglwys Bewis (population 15) to Lower Coyty (1,165). The average annual poor-rate expenditure for the period 1834-36 had been £6,879 or 8s.1d. per head of the population. 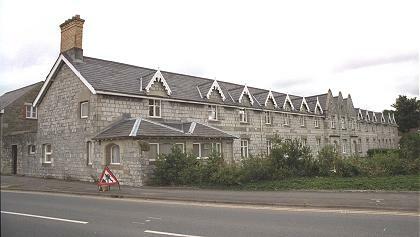 A Bridgend & Cowbridge Union workhouse for 200 inmates was erected in 1836-8 at the east side of Quarella Road in Bridgend. The Poor Law Commissioners authorised an expenditure of £4,400 on construction of the building which was intended to accommodate 200 inmates. It was designed by George Wilkinson who was the architect of many other union workhouses in England and Wales including those at Neath and Cardiff. 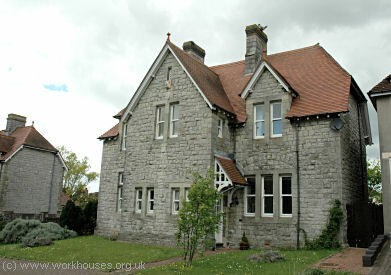 The Bridgend & Cowbridge workhouse, built in his favoured Elizabethan style, also foreshadowed appearance of the workhouses in Ireland all of which were designed by Wilkinson (see for example Swineford). The entrance block lay across the south of the site. This originally had a two-storey central portion, nine bays wide, with single storey extensions at each side. The central portion had two doorways, one for males at the left and one for for females at the right. The porter's lodge lay in-between the two. Bridgend & Cowbridge entrance from the south, 2000. On the men's side, moving away from the entrance, were the male admissions' ward, the old men and young boys' ward, then a younger men's ward in the single storey portion. On the women's side, the two storey section contained a mother and young children's ward. The single storey sections of the entrance block were later replaced by two-storey sections. 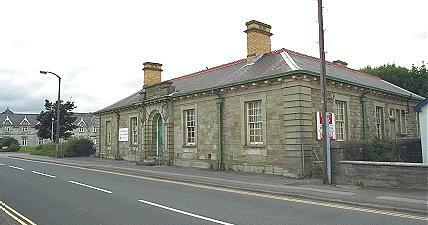 Bridgend & Cowbridge entrance block from the south-west, 2000. To the rear of the entrance block were male and female exercise yards. These were separated by a range containing the chapel/dining hall which connected to the workhouse's three-storey central hub. The octagonal hub had kitchens on its ground floor and observation windows which allowed the yards to be supervised from the upper floors. Male and female accommodation wards ran from each side, parallel to the entrance block. Bridgend & Cowbridge east wing from the north-east, 2000. A further range running northwards contained a school room. Apparently (Thomas and Wilkins, 1995), the Guardians soon decided that the schoolroom should be turned into the workhouse chapel and to do without a schoolroom. A vagrants' ward was erected along the Quarella Road edge of the site. Bridgend & Cowbridge Union vagrants' ward and porter's house, 2005. In 1911, a new union offices building was erected just to the south of the workhouse. Bridgend & Cowbridge Union Offices from the south-west, 2000. 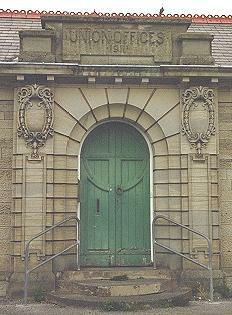 Bridgend & Cowbridge Union Offices entrance, 2000. 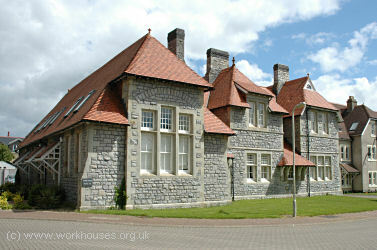 Expansion of hospital facilities took place at the north of the workhouse, with the site later becoming Bridgend General Hospital. 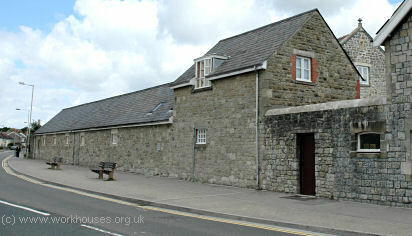 The surviving workhouse buildings have now been converted for use as accommodation for the elderly. 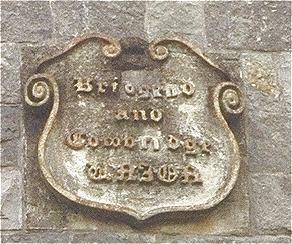 In January, 1879, the Bridgend Union opened a group of cottage homes for the accommodation of pauper children. These were located at the east side of Merthyr Mawr Road to the south of Bridgend. The site location and layout is shown on the 1921 map below. Bridgend cottage homes site, 1921. The six homes, each accommodating ten children, together with school and administrative blocks, were arranged around a "village green". 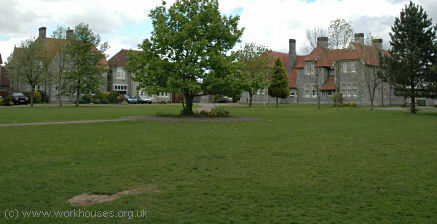 They scheme was designed by Mr Harris and the building contract of £4,940 was awarded to William David of Newcastle Hill. Bridgend cottage homes from the south-east, c.1913. 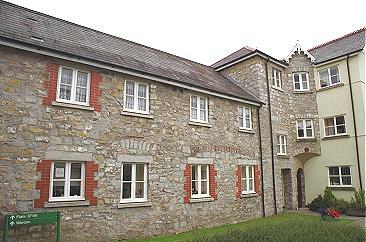 Bridgend cottage homes adminstrative block, 2005. 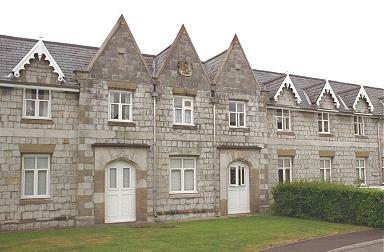 Bridgend cottage homes children's house, 2005. The former homes are now in private residential use.